Dr. Beineke is professor emeritus, Purdue University, and developer/inventor of the patented genetically improved black walnut cultrivars. 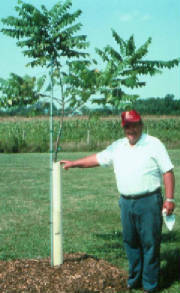 He writes: "Flood plains are excellent sites for planting trees, especially black walnut. I planted 1200 black walnut and 200 oak trees in a small creek bottom and protected them with Miracle Tubes. "A seven-inch rainfall upstream sent a torrent of water two to four-feet deep over the entire site. Without the tubes, the trees would've been buried in debris, logs, mud, hay, etc. However, thanks to the Miracle Tubes, the debris caught on the outside of the tubes and wrapped around them. The seedlings inside were still green and happy. "Out of 1400 tubes only eight right next to the creek were washed out." Henrietta and Malcolm Olson of OLSON'S TREE FARM are long-time users and researchers of tree protection devices and methods. They write: "...Tree Pro protectors worked much better than the [closed system] tube-type, not only in the first and second year's survival rate, but also in the ease of opening them up in the fall to get new growth hardened down for the upcoming winter. Another advantage of the Tree Pro tube according to the Olson's is that they do not provide a cozy home for rodents, unlike some other shelters. They report finding "...only one solitary mouse in the 80 Miracle Tube shelters we installed. In the other shelters we used, we found that between 50 and 60% were infested with mice, most with families of mice." It is believed that the higher incidence of rodent infestation has to do with the cozier environment provided by some protectors. Unvented protectors that are pressed down into the ground are the worst offenders in this regard because they provide rodents with a warmer environment. Malcolm and Henrietta have since replaced almost all of the tube-type protectors with Tree Pro protectors. According to the Olson's, "The walnut family (black, English, heartnut, etc.) do very poorly in standard 3 to 4 inch tubes, in which most will die. These nut trees with compound leaves need more space as they are just too crowded. After a lot of discussion with Tree Pro about the problem, they now make special large flat roll-up perforated tubes [called Super Wides] for walnuts. "We have been assembling two regular flat roll-ups together and they do fine. On large potted, leafed-out walnuts we have assembled three Tree Pros together. This of course costs more, but it's well worth it when planting a $30 grafted tree."